Overnight trip to the Baltimore. Jumped off a white marlin on the evening troll. Despite all the lights and bait our best efforts to catch a shark, tuna or even raise some squids all failed. Went Tile fishing in the morning and caught 23 tilefish including 2 blue line tiles that you were just a few pounds short of the current IGFA World record. Fished 65 to 100 Fathoms in the Baltimore 1 keeper Yellowfin and 1 throwback in the first 30 minutes at 68 fathoms on the 180 line only 1 other bite rest of the day. Today you were a hero or a zero tried our best stayed out an extra hour just couldn’t get a bite. 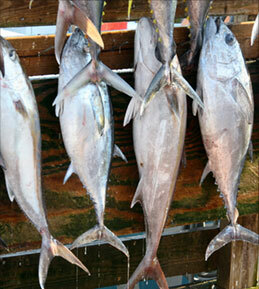 Fished the Baltimore caught 3 BLT yellowfin and were lucky to have them. Also had a few throw backs. Many boats had no fish. Bite continues to be very spotty. Slow day a lot of throw backs. Landed a 56lb yellowfin. This was the largest fish caught at least in our Marina. Fished just inside the Poor Man’s Canyon for day #2 of the 2013 Mako Mania Tournament. 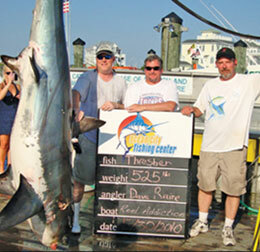 Released 1 Blue Shark, lost an estimated 300lb mako and boated a 109lb mako which we took to the scales. Ended up as a 4th place money fish. 1 of only 5 boats out of 28 to catch a qualifying mako. 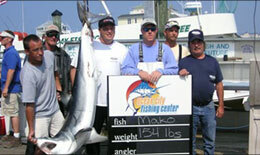 First trip of the year fished the 2013 Mako Mania Tournament. Released a 90lb Mako and a 145lb Tiger Shark. 11 Blue Tilefish caught in the Baltimore. 6 hours of chunking at the 270 line above the dog and not a bite. Trolled rest of the day captured 3 dolphin and 1 bonita. ReelAddictionCharters.com Copyright© 2019 Reel Addiction Charters.